Sunnydaze 5W Solar Pump and Panel Fountain Kit With 2 Spray Heads, 132 GPH, 56-Inch Lift | Fountain City Art Ctr. 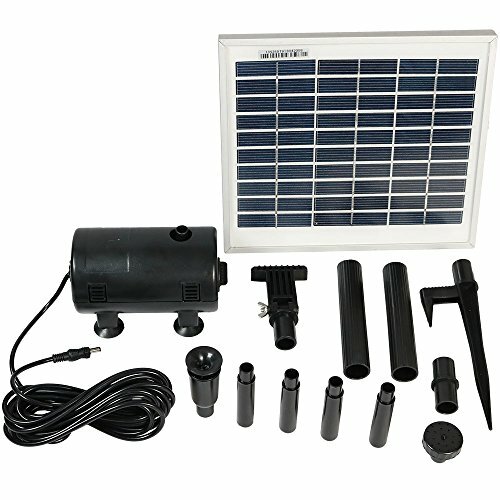 Create your own outdoor fountain experience with this convenient solar pump and panel kit. This panel does not store solar power and must be in direct sunlight to work. This kit comes with a 15V DC brush less pump with a 16' cable. The 5W panel can be placed within 16' of the pump, which allows you to place it in the perfect location for maximum sunlight. A ground spike is provided for mounting if needed. This feature must be in direct sunlight for the pump to work best. Dimensions: Panel; 10.5 inches wide x 9.25 inches long. Pump; 5.5 inches long by 3.5 x 3.5 inches. Includes 15V DC brushless pump with 16' cable so you can place it anywhere in your yard. Features 2 spray head options so you can customize and select which design is best for you. Water flow is 132 GPH with maximum head of 56". The pump comes with adapters so you can make your own waterfall or convert an electric pump to a solar.